Major classification of cables used in computer networking. Straight cable, so named because the eight wires inside the cable go straight through the wire. While the wires may be twisted inside to reduce electromagnetic interference (EMI), the wire that’s connected to Pin 1 on one end is connected to Pin 1 on the other end, and so on. Crossover cable is so named because the wires do cross over between pins. This allows the devices to both send and receive at the same time, and crossover cables are a must for directly connecting ports on Cisco switches to create a trunk. Cable is the medium through which information usually moves from one network device to another. There are several types of cable which are commonly used with LANs. In some cases, a network will utilize only one type of cable, other networks will use a variety of cable types. The type of cable chosen for a network is related to the network’s topology, protocol, and size. The following sections discuss the types of cables used in networks . 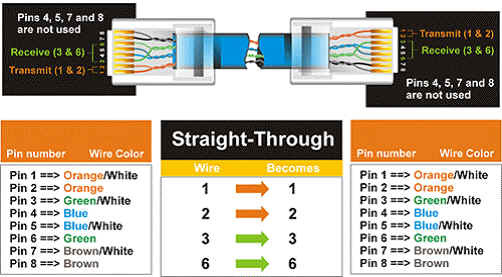 Twisted pair cabling comes in two varieties: shielded and unshielded. Unshielded twisted pair (UTP) is the most popular and is generally the best option for school networks . The quality of UTP may vary from telephone-grade wire to extremely high-speed cable. The cable has four pairs of wires inside the jacket. Each pair is twisted with a different number of twists per inch to help eliminate interference from adjacent pairs and other electrical devices. The tighter the twisting, the higher the supported transmission rate and the greater the cost per foot. The EIA/TIA (Electronic Industry Association/Telecommunication Industry Association) has established standards of UTP and rated six categories of wire. The standard connector for unshielded twisted pair cabling is an RJ-45 connector. This is a plastic connector that looks like a large telephone-style connector (See fig. 2). A slot allows the RJ-45 to be inserted only one way. RJ stands for Registered Jack, implying that the connector follows a standard borrowed from the telephone industry. This standard designates which wire goes with each pin inside the connector. Coaxial cabling has a single copper conductor at its center. A plastic layer provides insulation between the center conductor and a braided metal shield . The metal shield helps to block any outside interference from fluorescent lights, motors, and other computers. Although coaxial cabling is difficult to install, it is highly resistant to signal interference. In addition, it can support greater cable lengths between network devices than twisted pair cable. The two types of coaxial cabling are thick coaxial and thin coaxial. Thin coaxial cable is also referred to as thinnet. 10Base2 refers to the specifications for thin coaxial cable carrying Ethernet signals. The 2 refers to the approximate maximum segment length being 200 meters. In actual fact the maximum segment length is 185 meters. Thin coaxial cable has been popular in school networks, especially linear bus networks. Thick coaxial cable is also referred to as thicknet. 10Base5 refers to the specifications for thick coaxial cable carrying Ethernet signals. The 5 refers to the maximum segment length being 500 meters. Thick coaxial cable has an extra protective plastic cover that helps keep moisture away from the center conductor. This makes thick coaxial a great choice when running longer lengths in a linear bus network. One disadvantage of thick coaxial is that it does not bend easily and is difficult to install. The most common type of connector used with coaxial cables is the Bayone-Neill-Concelman (BNC) connector . Different types of adapters are available for BNC connectors, including a T-connector, barrel connector, and terminator. Connectors on the cable are the weakest points in any network. To help avoid problems with your network, always use the BNC connectors that crimp, rather screw, onto the cable. Fiber optic cabling consists of a center glass core surrounded by several layers of protective materials . It transmits light rather than electronic signals eliminating the problem of electrical interference. This makes it ideal for certain environments that contain a large amount of electrical interference. It has also made it the standard for connecting networks between buildings, due to its immunity to the effects of moisture and lighting. There are two common types of fiber cables — single mode and multimode. Multimode cable has a larger diameter; however, both cables provide high bandwidth at high speeds. Single mode can provide more distance, but it is more expensive. More and more networks are operating without cables, in the wireless mode. Wireless LANs use high frequency radio signals, infrared light beams, or lasers to communicate between the workstations, servers, or hubs. Each workstation and file server on a wireless network has some sort of transceiver/antenna to send and receive the data. Information is relayed between transceivers as if they were physically connected. For longer distance, wireless communications can also take place through cellular telephone technology, microwave transmission, or by satellite. Wireless networks are great for allowing laptop computers, portable devices, or remote computers to connect to the LAN. Wireless networks are also beneficial in older buildings where it may be difficult or impossible to install cables. The two most common types of infrared communications used in schools are line-of-sight and scattered broadcast. Line-of-sight communication means that there must be an unblocked direct line between the workstation and the transceiver. If a person walks within the line-of-sight while there is a transmission, the information would need to be sent again. This kind of obstruction can slow down the wireless network. Scattered infrared communication is a broadcast of infrared transmissions sent out in multiple directions that bounces off walls and ceilings until it eventually hits the receiver. Networking communications with laser are virtually the same as line-of-sight infrared networks. The Wi-Fi Alliance is a global, non-profit organization that helps to ensure standards and interoperability for wireless networks, and wireless networks are often referred to as WiFi (Wireless Fidelity). The original Wi-Fi standard (IEEE 802.11) was adopted in 1997. Since then many variations have emerged (and will continue to emerge). Wi-Fi networks use the Ethernet protocol. Wireless networks are much more susceptible to unauthorized use than cabled networks. Wireless network devices use radio waves to communicate with each other. The greatest vulnerability to the network is that rogue machines can “eves-drop” on the radio wave communications. Unencrypted information transmitted can be monitored by a third-party, which, with the right tools (free to download), could quickly gain access to your entire network, steal valuable passwords to local servers and online services, alter or destroy data, and/or access personal and confidential information stored in your network servers. To minimize the possibility of this, all modern access points and devices have configuration options to encrypt transmissions. These encryption methodologies are still evolving, as are the tools used by malicious hackers, so always use the strongest encryption available in your access point and connecting devices. Enable the strongest encryption supported by the devices you will be connecting to the network. Use strong passwords (strong passwords are generally defined as passwords containing symbols, numbers, and mixed case letters, at least 14 characters long). Use a wireless router that places all wireless connections on a subnet independent of the primary private network. This protects your private network data from pass-through internet traffic. Every access point has a Service Set IDentifier (SSID) that by default is broadcast to client devices so that the access point can be found. By disabling this feature, standard client connection software won’t be able to “see” the access point. However, the eves-dropping programs discussed previously can easily find these access points, so this alone does little more than keep the access point name out of sight for casual wireless users. Fast setup – If your computer has a wireless adapter, locating a wireless network can be as simple as clicking “Connect to a Network” — in some cases, you will connect automatically to networks within range. Mobility – With a laptop computer or mobile device, access can be available throughout a school, at the mall, on an airplane, etc. More and more businesses are also offering free WiFi access (“Hot spots”).. Expandability – Adding new computers to a wireless network is as easy as turning the computer on (as long as you do not exceed the maximum number of devices). Interference – Because wireless networks use radio signals and similar techniques for transmission, they are susceptible to interference from lights and electronic devices. Security – Be careful. Be vigilant. Protect your sensitive data with backups, isolated private networks, strong encryption and passwords, and monitor network access traffic to and from your wireless network. Speed – The transmission speed of wireless networks is improving; however, faster options (such as gigabit Ethernet) are available via cables. If you are only using wireless for internet access, the actual internet connection for your home or school is generally slower than the wireless network devices, so that connection is the bottleneck. If you are also moving large amounts of data around a private network, a cabled connection will enable that work to proceed much faster. Inconsistent connections – How many times have you hears “Wait a minute, I just lost my connection?” Because of the interference caused by electrical devices and/or items blocking the path of transmission, wireless connections are not nearly as stable as those through a dedicated cable.